Your knee is the largest joint in your body and one of the most complex. It is made up of the lower end of the femur (thighbone), the upper end of the tibia (shinbone), and the patella (kneecap). Ligaments and tendons connect the femur to the bones of the lower leg. The four main ligaments in the knee attach to the bones and act like strong ropes to hold the bones together. Muscles are connected to bones by tendons. The quadriceps tendon connects the muscles in the front of the thigh to the patella. 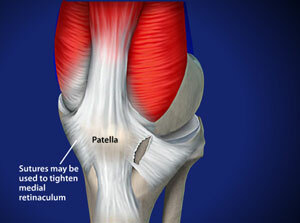 Segments of the quadriceps tendon—called the patellar retinacula—attach to the tibia and help to stabilize the patella. Stretching from your patella to your tibia is the patellar tendon. Several structures in the knee joint make movement easier. 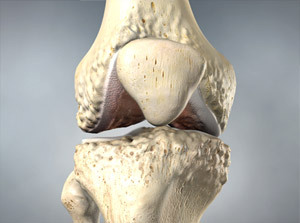 For example, the patella rests in a groove on the top of the femur called the trochlea. When you bend or straighten your knee, the patella moves back and forth inside this trochlear groove. A slippery substance called articular cartilage covers the ends of the femur, trochlear groove, and the underside of the patella. Articular cartilage helps your bones glide smoothly against each other as you move your leg. Also aiding in movement is the synovium—a thin lining of tissue that covers the surface of the joint. The synovium produces a small amount of fluid that lubricates the cartilage. 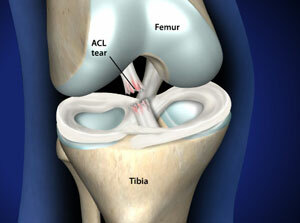 In addition, just below the kneecap is a small pad of fat that cushions the kneecap and acts as a shock absorber.